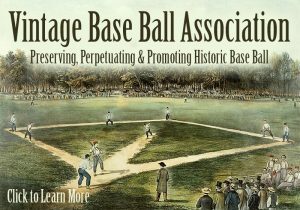 Vintage Base Ball is the re-creation of the game as it was played at any particular time, though most play by the rules of the early 1860’s (some play earlier, some play later… most teams in the Cincinnati area play 1869). The Ohio Village Muffins in Columbus, OH, were the first area team to play the vintage game, beginning in 1981, and were instrumental in the creation of the Vintage Base Ball Association (VBBA), which serves to educate teams on the proper and most accurate way to present vintage base ball. There are now over 100 teams throughout the country, with the majority based in Ohio and the Midwest, and many associated with museums or historic sites. And, as in the earliest days of baseball, all teams are amateur. The Cincinnati Buckeyes and their fellow clubmates, the Cincinnati Red Stockings, play by the rules of 1869 when playing at Heritage Village. They also have a few ground rules for the field at Heritage Village. However, the game of baseball is basically the same in any era – nine fielders play for nine innings, with each team trying to outscore the opposition by hitting a ball with a bat. But there are many subtleties to the vintage game that spectators should notice, as well as interpretations of rules and customs that sometime differ between teams and venues. Vintage players do not use gloves. Gloves were not widely used in the game until the 1880’s. The bat is wooden, much heavier and more variable in size and shape than a modern bat, and the ball slightly larger and softer than a baseball of today, with a lemon-peel stitch (as opposed to the modern “figure-8”). Typically, the game was played on any flat, grassy field that was as free of obstructions as possible. We try to present 1860’s base ball as a gentlemen’s game, and our players are expected to act as such. There’s no spitting, swearing or other action that may be offensive to a lady. We congratulate our opponents when a good play is made, and assist the umpire in making close calls with honesty and fair sportsmanship. Only one umpire is used in the vintage game, and he typically stands behind and off to the side of the field. If he cannot make a judgement on a play, he may use both players and spectators alike to assist. No hand signals were used; decisions were shouted. He does not call balls and strikes, but rather can issue warnings to the striker (batter) or the pitcher if the at-bat is not proceeding well. If such warning is administered and the offender not compliant, the striker is either called out for failing to swing at three hittable pitches or is allowed his first if the pitcher offers no hittable pitch after three are tossed. If the striker fails to strike the ball after three swings, he is out. Foul balls are not counted as strikes. The pitcher stood only 45′ from the plate and pitched underhand. There is no mound. Unlike today, the pitcher’s responsibility is to pitch the ball “near as possible over the centre of home base” so that the striker can put it into play. A coin or stone toss preceded each game, and the winning team captain could elect to take the field or hit first. The batting order is not restricted to nine players, and players can be benched and return as often as needed (this is a vintage game custom, rather than rule). At the beginning of each inning, the batter that follows the player that made the final out of the previous inning (as a batter or a runner) is the first batter of the inning… this is a rule. In the earlier days of vintage base ball, it was common custom to restrict base-men to two-steps from their base, and outfielders to a “straight-up” position, with the shortstop being the only unrestricted position. However, there is no rule about this, and this custom is slowly being phased out as it is considered unlikely to be historically accurate. As there is no specific rule… most places, ours included, allow plays to be made after the ball has struck an obstruction that is not the ground… for instance, if a struck ball hits a tree trunk and is caught immediately, it is an out. However, if it comes to rest, say, in a chair without touching the ground, it is deemed dead. Some of the more noticeable nuances to the vintage game occur with foul balls. In the early 1860’s, players could catch a fair or foul ball on the fly or on the first bound (bounce) to get the batter out. In 1865, that “first bound” rule was eliminated for fair balls (it was deemed “unmanly”). But a foul ball caught on the fly or on the first bound is still an out, even if it is just a foul tick back to the catcher. The Cincinnati Buckeyes will experience both of these rule-sets in any given season as they play teams from both times. A ball is also deemed fair or foul by what it strikes first, and going past first or third base does not matter. So if a ball is struck 2 feet into fair territory, then immediately spins foul, it is still a fair ball. If a ball strikes a tree in foul territory and lands in fair territory, it is still foul… and can be caught on the fly or first bound. However, a player cannot intentionally swat a ball from one to the other. In the modern game, runners have “free backs” on foul balls. This luxury is not available to the vintage player. If the foul ball is recovered and returned to the hands of the pitcher, the pitcher may make a play on any tardy runner that has not returned to their base of origin. One of the most difficult vintage rules for a new ballist to overcome is that strikers are not permitted to overrun first base. If a player does, he can be tagged out if he does not return to an open base safely. Stealing bases is not specifically defined in the 1869 rules, and is therefor the most widely debated issue among vintage teams. Many teams in the Midwest, including ourselves, honor the long-time custom of advancing only if the catcher muffs the pitch or if it bounces more than once. Two-step leadoffs are also commonly linked with this custom. This custom is not historically accurate, but many teams find this interpretation acceptable as it opens the game up to a wider variety of players and puts more focus on the history of the game, rather than the competition of it. Any ball thrown over the gravel road behind first base or over the picket fence behind third base is considered dead and one base is awarded to all base runners. Any fair ball struck over either is “all-you-can-get” as both are nearly impossible to do (especially with the chicken wire behind the picket fence). There are NO ground rules when it comes to the woods beyond our outfield, including base balls that are lost to sight. A batter may take all four bases if the ball is not returned to make a play on him.